During the last two years, CSISA has facilitated more than 1,300 farmers in Bihar and eastern Uttar Pradesh to become service providers and has built their capacities through trainings on conservation agriculture, small-scale mechanization, post-harvest technologies, and business development services. CSISA is now aiming to help them become rural entrepreneurs providing multiple services through a “single window”. The eastern Indo-Gangetic Plains, in which CSISA hubs of Bihar and eastern Uttar Pradesh (UP) operate, are on the verge of a second Green Revolution, this time driven by agronomic management rather than varieties. The pace at which new innovations are reaching farmers has been accelerated through CSISA’s creation of a network of service providers (SPs), linked with CSISA’s partner agencies and empowered through a variety of tailored capacity-building efforts. 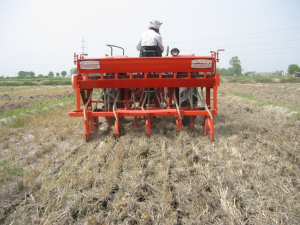 The concept of custom-hire service began evolving as farmers started purchasing conservation agriculture machines including zero-till seed drills, laser land levellers, rice transplanters, bed planters and threshing machines. These farmers become SPs when they provide mechanized services to other farmers including smallholder and poor farmers who cannot afford to purchase machines on their own. During the last two years, CSISA has facilitated more than 1,300 farmers to become SPs and has been building their capacities through trainings on relevant knowledge and skills, such as conservation agriculture and small-scale machinery. In 19 districts across Bihar and eastern UP, CSISA has been playing a critical role in facilitating a shift in the way new agricultural technologies are delivered. After creating a network of SPs, CSISA links them with the Department of Agriculture (DOA) and a variety of important private sector actors. CSISA also demonstrates that yield stagnation can be resolved through agronomic management, not only the replacement of varieties. A survey of service providers done by CSISA in Bihar and eastern UP has found that subsidy-based interventions helped farmers to acquire new machines, but often farmers’ lack of knowledge about how to use the machines forced many farmers to abandon them. In this scenario, a strong network of SPs enables farmers to adopt mechanization not only to intensify their cropping systems but also to improve their productivity by undertaking the timely seeding and harvesting of crops. The survey also showed that SPs are well-positioned to deliver new technologies in part because they represent the same communities they are serving, and because they can reduce the transaction costs associated with adopting new technologies. Based on data from 2013-14 from 52 zero-till service providers, the average net profit was US$360/year without any subsidy on the machine. Profit increased to US$456 and US$533/year with a subsidy of US$322 and US$645 per machine, respectively. The paddy thresher SPs earned an average net profit of US$1,036/year without subsidy and US$1,326/year on a machine subsidy of US$968. In the long-run, SPs can stay competitive without machine subsidies. Talking about the entrepreneurial energy among the SPs in the districts where CSISA works, R.K. Malik, the Objective Leader for CSISA’s hub-based activities (including Bihar and eastern UP), said, “It is expected that in the future SPs will complement their farm machinery-based services with knowledge-based services including input supply and extension services for crop management”. CSISA aims to encourage some SPs to become small-scale rural entrepreneurs providing multiple services through a “single window” and market-oriented service approach. Malik added that SPs will be able to complement the extension services provided through the state’s DOA, and enable farmers to more quickly adopt new technologies and management practices.